If a booking is made for a group, then the group is responsible for paying all agreed upon amounts as stated online in full upon arrival at the Hostel. Group Cancellations like all other cancellations must be made at least 24 hours prior to your arrival date. Reduction in Numbers Policy means that any single member of the group is still liable for the cost of their stay, even if they must leave early. This is part of the overall group policy. Please do not make bookings for large groups and expect one or two people to able to leave early at no cost. No Shows will still be charged the Hostelworld booking fee of 15% of the total booking cost. The following group types are not accepted by this hostel: Junior / Primary School, High / Secondary School, Stag/Hen/Bachelor Party, Cultural Group If you have misrepresented the type of group you are booking for, your booking may be cancelled by the hostel." The Hornbill is a comfy hangout with espresso coffee, books and boardgames. There are plenty of spaces to chill including an array of seats, sofas, swings, decking area and hidden garden where you can read, write or watch everyday Cambodian life pass by. We have a cinema space for 10 guests which plays movies and documentaries most nights. In the day its a chill space to play games, have a nap or do some yoga. Our cafe is open early serving real coffee, breakfast, baked goods, home made snacks, cocktails and family dinner. All our rooms are clean and simple. Upstairs we have a 6 bed and 8 bed dorm and 4 private rooms. All beds have a net and fan and the rooms have shelves and charging stations. Private rooms have towels and a large mat for the beach. We offer all guests secure storage. Our guests can also enjoy the balcony space which has a large sofa and bar top with a jungle view. For the rainy days there is a PS4 with lots of different games. The bathrooms are shared facilities. 5. Reception working hours: 7:30-23:00. I had an absolutely wonderful stay at Hornbill Guesthouse - the rooms are great, the hostel itself is really comfy and cozy and breakfast is perfect!! Really great place for a solo traveller or anyone looking to chill for a few days. If you’re going to Koh Rong Samloem, you have to stay at The Hornbill!! Amazing atmosphere, we met so many lovely people here and amazing staff too who were so kind and helpful, especially with my food allergies (their vegan pancakes are the bomb!!) As cliche as it sounds, it really did feel more like a home than a hostel. We extended our stay once and quite honestly we wished we could have extended it again. We hope to be back soon! Staff here are incredible. Go for a few days, stay a week and still find it hard to drag yourself away! We stayed here for a couple of nights, staff were lovely and offered to help in any way possible. Location was great, and the bedroom and bathrooms were clean. 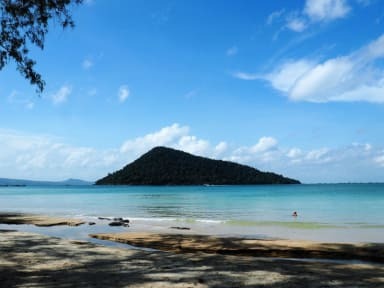 Perfect for a short or longer stay on Koh Rong Samloem. Super nice staff. Really nice space. Like a treehouse kind of. Good coffee. Good dog(s). Deffo feel like they go the extra mile for you. Lovely staff and location, good brunch, no air conditioning or WiFi and unreliable island water meant showers were often out of action (most hostels have same issues though). Construction work was happening every morning from 8am, not ideal. Generally a great place to stay on KRS. The staff is really nice, but they smoke a lot of weed / pot / hash. (I’m a newb, and don’t recognize the difference). The food is really good, especially their homemade cakes and bread! Free water refill if you have a reusable bottle is a huge plus for me! 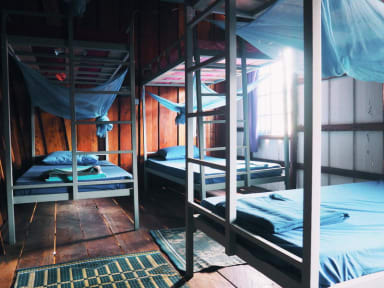 Beds are comfy and have mosquito nets, common area is cozy. Bathrooms are clean and nice. Ok hostel. The dorms are scorching hot at night since there are only a couple of fans. Some of the mosquito nets have holes. Loads of mosquitos in the rooms and they're swarming in the bathrooms, so showering involves trying to avoid being devoured. The staff are lovely but the building is definitely in need of some updates. Doors to the rooms do not lock and there are no lockers, however, this never was an issue. Overall decent value but I would stay elsewhere if I return to the island.